Texas Democrats held their biennial convention this weekend in Fort Worth, putting on a largely united front and focusing intensely on the family separation crisis at the border, among other highlights from the three-day gathering. FORT WORTH — Thousands of Texas Democrats gathered here over the past three days for their biennial convention, looking to build momentum toward a November election where the long-beleaguered party sees more opportunities than usual thanks to President Donald Trump. The more than 7,500 delegates who flocked to the city's convention center each day heard from all their statewide candidates — including the brightest star, U.S. Senate hopeful Beto O’Rourke. They also re-elected state Party Chairman Gilberto Hinojosa, installed some other new leaders and found themselves on the front lines of the political response to the family separation crisis at the border. The Democrats’ confab fell a week after state Republicans staged their convention in San Antonio, an affair that put the party’s embrace of the president on display, as well as some pitched family disagreements. "We need to be about unity"
Texas Democrats may be long out of power, but they have at least one thing going for them that Republicans are still working on — something resembling unity. Democrats largely put forward a united front in Fort Worth, with few intra-party schisms spilling out into the open like they did in 2016, when some tensions lingered from the presidential primary between Hillary Clinton and Bernie Sanders. It was a contrast with the state GOP convention last weekend in San Antonio, which featured a long, bitter battle on the floor over the chairman’s race. The Democrats had a few contested races for party officers on the floor, but none led to protracted fights, and the candidates recommended by the Nominations Committee all prevailed easily on voice votes in the end. The victors included Hinojosa; Carla Brailey, who was elected to replace retiring vice chair Fredericka Phillips; and Mike Floyd, a 19-year-old Pearland ISD trustee — the youngest elected official in Texas — who won the party treasurer job with ease. “We need to be about unity,” Peoples told delegates after announcing she was withdrawing her name from consideration, earning loud cheers and standing ovations from many delegates. The convention, however, did close on a bit of a sour note. A delegate made a motion to suspend the reading of more than 30 remaining resolutions and pass them all so that people could go home. That led to a close-sounding voice vote, and U.S. Rep. Marc Veasey of Fort Worth, the convention chairman, ruled in favor of the ayes, abruptly bringing the three-day gathering to an end. U.S. Senate candidate Beto O’Rourke has been credited with generating the most enthusiasm among Democratic statewide candidates this election cycle. That seemed to hold true in Fort Worth — but it was also clear that Democrats were amped up about some of their other contenders too. Before O’Rourke spoke Friday evening, the crowd gave rousing receptions to ticketmates such as Kim Olson, the feisty nominee for agriculture commissioner, and Mike Collier, who let loose a stream of crowd-pleasing zingers about his opponent, Lt. Gov. Dan Patrick. Still, there was no denying O’Rourke’s star power. He was greeted with shouts of “We love you!” as he took the stage, and while leaving the convention center afterward, he could not take more than a few steps without being stopped by admirers. After he finally made it out, he headed to a packed campaign event at a nearby bar. Even after he left Fort Worth on Saturday to visit the Tornillo immigrant detention camp near El Paso, he was still on the lips of speakers at the convention. 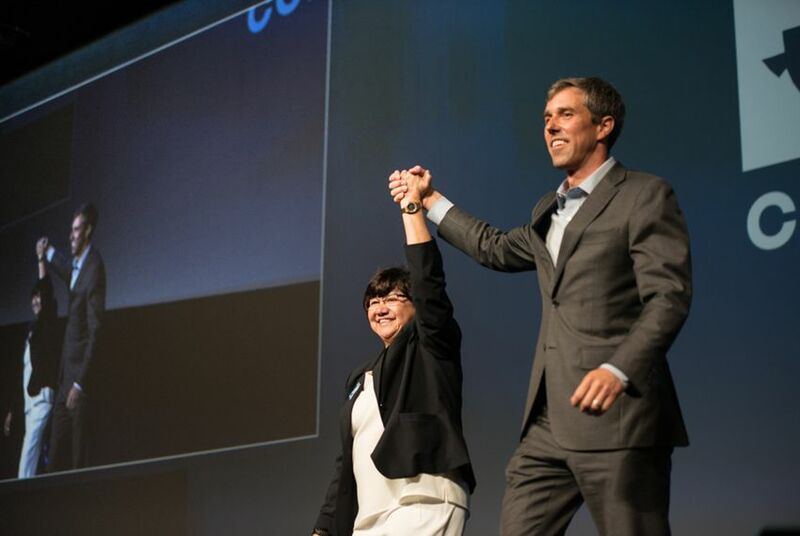 Among them was state Rep. Gina Hinojosa of Austin, who nodded to O’Rourke’s 254-county achievement while making a re-election pitch for her father, state party Chairman Gilberto Hinojosa. From start to finish, the dominant issue of the convention was the family separation crisis on the border, where thousands of immigrant children have been detained separately from their parents. The overwhelming majority of speakers wove the subject into into their remarks — often at length — and it was the subject of a rally Saturday morning that drew hundreds of delegates to a convention center lobby as well as balconies overlooking it. Addressing delegates hours later, U.S. Rep. Sheila Jackson Lee of Houston used some of her time to play now-infamous audio of children crying out for their parents at an immigrant detention facility. “If you do not want to ever hear that in America again, if you will take my hand and march as fighters for those who cannot help themselves, if you will raise … then you vote for Democrats and change America,” Jackson Lee said. On the flip side of the family separation issue was a debate that’s playing out among Democrats across the country: the extent to which the party needs a message beyond its fierce opposition to Trump and his policies. The president was a reliable punching bag throughout the weekend, with speakers assailing him on a slew of fronts and working to tie their opponents to him — “a rubber stamp for Donald Trump” is how Justin Nelson described his foe, Attorney General Ken Paxton. The anti-Trump fervor hit a crescendo Saturday afternoon, when delegates heard from U.S. Rep. Al Green of Houston, a leading proponent of impeaching Trump in Congress. Green, who was the only speaker who used the I-word, got thunderous applause. But even among Trump's most strident critics, there was an acknowledgement during the convention that the Democratic message has to transcend anti-Trump hostility. “We have to tell people what we are for, not just what we’re against," Sri Preston Kulkarni, the Democrat challenging U.S. Rep. Pete Olson, R-Sugar Land, said in an interview. Kulkarni, who quit his State Department job to run for the seat, added: "I didn't resign just to complain about Trump every day. I resigned to say this is what America really is about — these are our values." By now, it's well-known that female candidates are fueling Texas Democrats' hopes this year in elections at all levels, from the gubernatorial race, where Lupe Valdez is taking on Republican incumbent Greg Abbott, to some of the most closely watched races for Congress and the Legislature. Yet the convention brought the so-called "Year of the Woman" into focus more than ever, with the party's top female recruits ubiquitous in convention halls and speaker after speaker reminding delegates of Texas' contributions to the national trend. "If anyone asks you, 'Are Texas women really badass?' you just answer with, 'Hold my purse and watch this,'" Olson said Friday afternoon, easily the biggest applause line of her speech. The enthusiasm for female candidates was on full display Saturday morning at the Lady Bird Breakfast, which was hosted by Annie's List, the group that works to elect Democratic women in Texas who support abortion rights. Valdez promised the crowd that "women are gonna clean up politics" this year, and M.J. Hegar — who is challenging U.S. Rep. John Carter, R-Round Rock — received long applause when she spoke of demanding better representation for women in her district. "John Carter, my congressman, closed the door on me when I tried to talk to him as a constituent," Hegar told her fellow Democratic women. "I know with the people in this room behind me, I can go back there, kick that door open and say, 'You're sitting in my seat!'"